Leading trainer in New York, 1957, '62, '66, '69 and 1998. Jerkens was the youngest trainer to be inducted into the Racing Hall of Fame; He was just only 45 years old. 2002- TURF WRITERS AWARDS -- The National Turf Writers Association announced its annual awards this week. 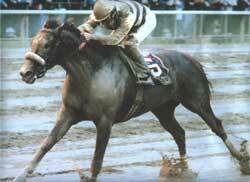 Hall of Fame trainer H. Allen Jerkens won the Mr. Fitz Award for "typifying the spirit of horse racing." He has trained over 160 stakes winners during his career. Sky Beauty, War Command, Beau Purple, Pocosaba Handsome Boy, Onion, Prove Out, Sensitive Prince Devil His Due, Classy Mirage, Admiral Vee, Kelly Kip, Shine On, Classy Morage. House Party, Mac's Sparkler, Harem Lady, Beaukins Mighty, Lak A Rose, Tunex, Peace Corps, Rixdal, Co Host, Red Orange, Duck Dance, Shine Again, King's Bishop. Virginia Rapids . In 1998, be beat both eventual Horse of the Year Skip Away and Gentleman in the Jockey Club Gold Cup with 34-1 Wagon Limit.